Welcome to mnamd.com. At Metropolitan Neurosurgery Associates, our expert team of neurosurgeons: Dr. Alfred Steinberger, Dr. Frank Moore, Dr. Marc Arginteanu, Dr. Kevin Yao, Dr. Yakov Gologorsky, and Dr. Omar Syed are dedicated to providing the finest possible care by utilizing breakthrough advances in brain and spine surgery. We treat many brain and spine conditions using a variety of cutting edge techniques from minimally invasive spine procedures to complex brain surgeries. Dr. Marc Arginteanu, M.D., F.A.C.S. Dr. Frank Moore has been ranked as a Top Doctor numerous times throughout many prominent publications over his career. Click to view his latest awards. Dr. Marc Arginteanu has been ranked as a Top Doctor numerous times throughout many prominent publications over his career. The latest awards were provided by New York Magazine and Inside Jersey. Click to view his page as listed on Castle Connolly Top Doctors. 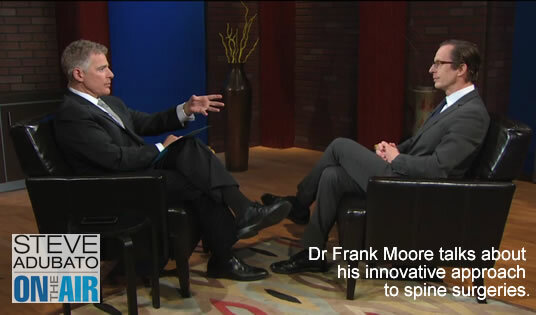 Dr Frank Moore talks about his innovative approach to spine surgeries.